If you're seeking tax preparation help, it may be beneficial to employ the services of a certified public accountant (CPA). CPAs have specialized training and education in the field of accounting, and some focus entirely on individual tax returns. If you have a typical tax return situation, it's often in your best interest to hire a CPA for tax preparation help. What if you do not have a typical situation? What if you are having problems with the IRS, and need help? While a CPA is ideal for the typical taxpayer, finding a professional that has experience in dealing with the IRS is important if you are having tax problems. If the IRS has started collections proceedings against you, it's likely that a CPA or tax attorney will not be knowledgeable enough to help you out of your situation. You need someone that has experience specifically dealing with the IRS when the IRS is acting in a collections capacity. Tax preparation is very different than tax collections, and each aspect of tax code has complicated regulations. CPAs are experts in tax preparation, but cannot necessarily help you if you have problems with the IRS due to failure to file in previous years, or a failure to pay a tax debt owed to the IRS. So, who can help you if you've already received a collection notice from the IRS? If you need tax preparation help for back taxes, a tax firm like Top Tax Defenders can help you bring your filings up to date and work with the IRS to find a solution to your problem. 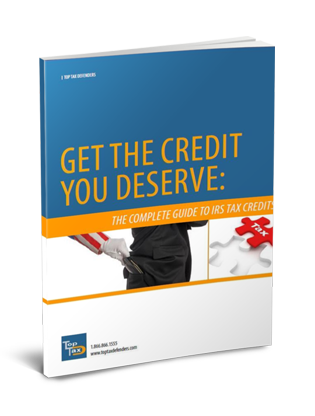 Your guide to IRS tax credits. Save money on this years taxes.